WITH JANAS, CALIBE INTERPRETS THE PIVOT HINGES OPENING. 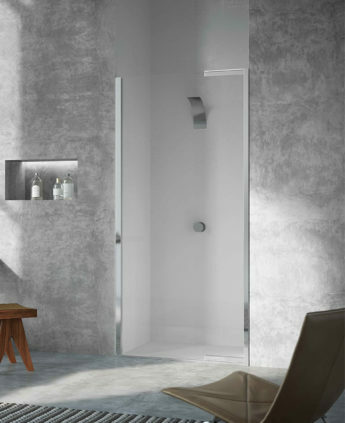 JANAS, COMPLETELY REALIZED IN STAINLESS STEEL AND TEMPERED GLASS, IS CUSTOMIZABLE ACCORDING TO THE WIDTH OF THE NICHE. IT GRANTS THE POSSIBILITY TO CHOOSE THE WIDTH OF THE DOOR SECTION WHICH CLOSES WITHIN IT. 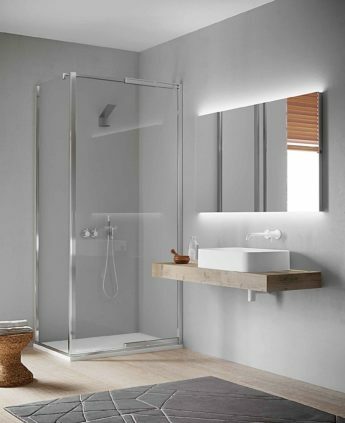 AT THIS PURPOSE, THIS GLASS SECTION COULD BE CUSTOMIZABLE UP TO 50 CM WIDTH. THE HANDLE, ONCE THE DOOR IS CLOSED, COULD BE INTEGRATED ON THE VERTICAL FRAME GRANTING AN ABSOLUTE MINIMALISM OF THE WHOLE STRUCTURE.